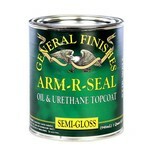 Arm-R-Seal is made with the highest-quality urethane resin, making them extremely durable and long-lasting. These oil-based finishes are formulated to penetrate to provide deep-down protection for that "natural" look. General Finishes "How To" Videos. Remove dust with a vacuum, tack cloth or water-dampened rag. 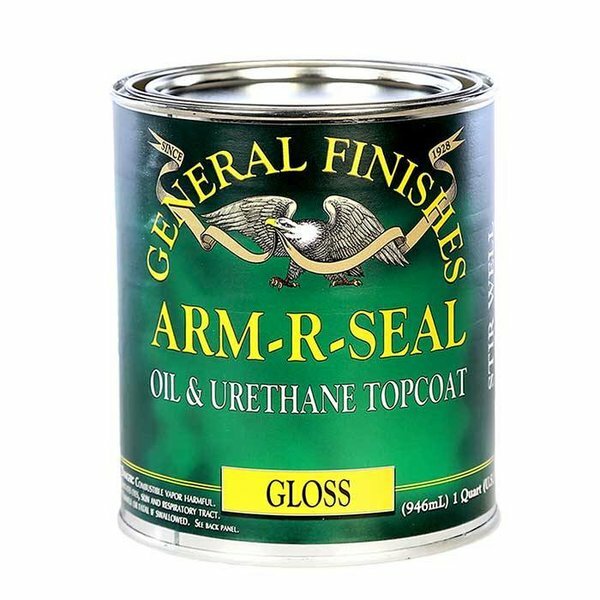 General Finishes recommends continuously stirring the wood finish throughout use to reincorporate solids that have settled to the bottom of the can. Alternately, stir well and immediately decant what you'll be using. 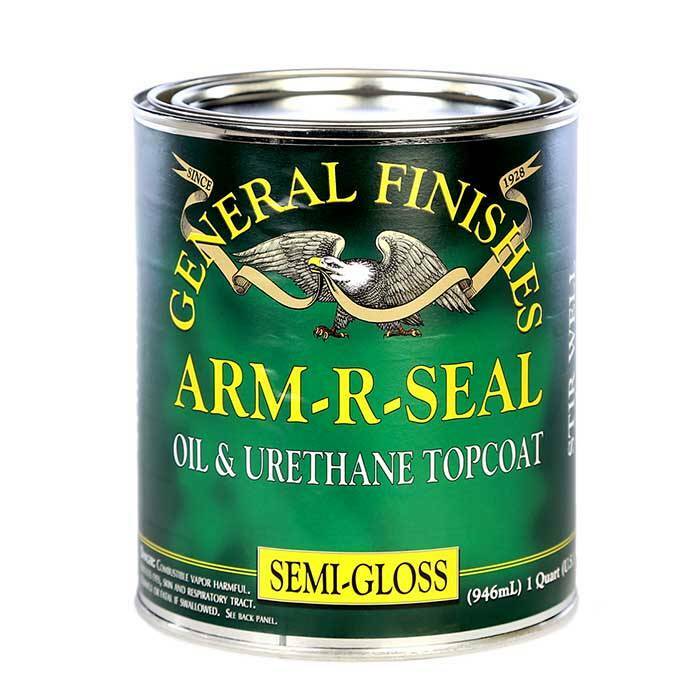 Arm-R-Seal is a thin urethane topcoat; the flatting agents used to create flatter sheens quickly settle to the bottom of the can and need to be redistributed often. If desired, thin topcoat with 10-15% mineral spirits unless restricted by local or state regulations. Use only with adequate ventilation. Open windows and doors, or use other means, to maintain fresh air flow during application and drying. Apply 3 coats. Additional coats will not improve durability. Hand application: Apply a liberal amount of product using a clean cloth, bristle brush, foam brush or pad applicator. The larger the surface the large the applicator needed. Wipe along the wood grain using smooth, even strokes. Remove excess with light pressure. 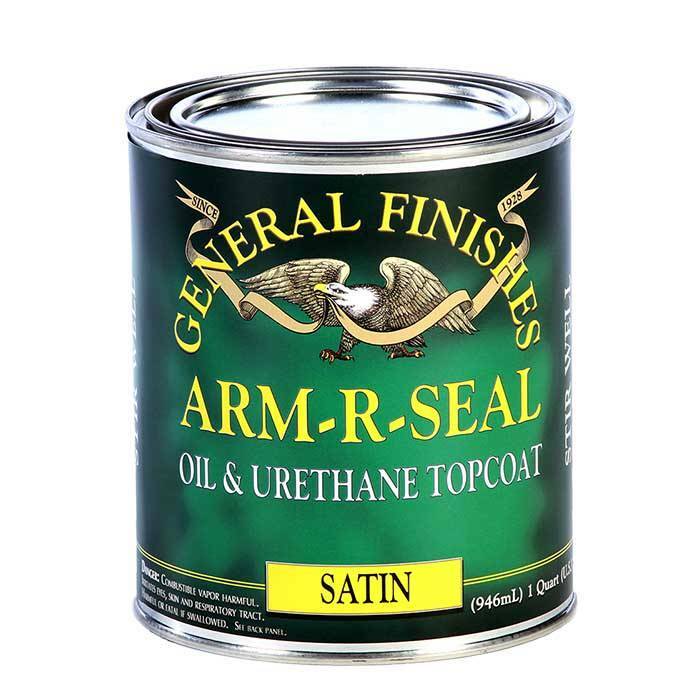 It is more important to avoid over brushing when using Satin Arm-R-Seal, because of the increased flatting agents needed to create a SATIN sheen. Semi-gloss and Gloss sheens are easier to apply because there are little to no flatting agents. Spray application: Arm-R-Seal can be sprayed successfully, but we prefer hand-application methods because it is easy to spray too much in one area. Spray thin coats and immediately wipe or brush out runs if they occur. HVLP: 1.0mm-1.2mm spray tip, medium air cap. Verify tip sizes with your equipment supplier. Click here for a general guide to spray tip sizes. Keep your gun at a 90* angle, 6-8" from the surface. On large, flat areas use wet, even patterns 6-8" wide. For narrow surfaces, reduce the fan pattern to 2-3" wide to reduce overspray. Overlap each pass 10% to conceal lines. Wear a full filter respirator (NIOSH/MSHA-approved) and work in a well-ventilated space. Read here for more information on spraying techniques. To accelerate dry time in humid conditions, work in a space with good ventilation and air movement. If you decide to re-coat before the recommended time, test dryness. Remove dust with a vacuum, tack cloth or clean, water-dampened rag before re-coating. 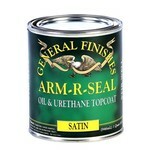 Oil-based finishes cure and harden completely after 30 days. Avoid placing heavy objects on surfaces that have not completely cured. Treat gently, and do not clean with commercial products during the cure period. Choose a semi-gloss or gloss sheen with little to no flatting agents. The more flatting agents, the more likely a topcoat will streak when applied. Optionally, if you want a flatter sheen, put down 2 coats of semi-gloss, followed by satin. Either stir and decant what you need to use immediately or stir frequently throughout the application process. Urethane topcoats are thin and the flatting agents used to create flatter sheens settle quickly to the bottom of the can. When working with a satin sheen, apply a liberal amount of product, and avoid pressure and back-brushing. Wipe along the wood grain using smooth, even strokes. Remove streaks that occur by buffing with 0000 steel wool, 400-grit sandpaper or fine-grade (220-320) foam sanding pad. You can also sand well and re-coat. 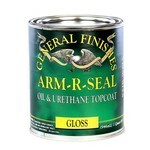 Arm-R-Seal can be used over Danish Oil, Linseed Oil & Tung Oil after they are dry. Allow oil to dry overnight before applying GF product.